Common sense and self-respect forgotten, candidate for President Kurmanbek Bakiyev gratefully accepted the outrageous outcome of the election. Judging by these results, Bakiyev performed better in the election than presidents Vladimir Putin, Dmitry Medvedev, Alexander Lukashenko, and Emomali Rakhmon had ever done. This level of "trust and confidence" matches crowning accomplishments of other Central Asian celebrities - Islam Karimov and Saparmurat Niyazov a.k.a. the Turkmenbashi. It took Democrat Bakiyev four years after the March 2005 Revolution to complete transformation into a carbon copy of his predecessor Askar Akayev he had fought with such abandon once. Ex-engineer from Jalalabad who had reached the pinnacle of the Kyrgyz political Olympus wearing a garland of tulips, Bakiyev finally evolved into a typical Asian despot constitutionally incapable of civilized political behavior. According to the Central Electoral Commission's interim calculations, Bakiyev had polled nearly 83%. The final count brought the figure down to 76%. 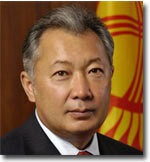 Bakiyev began his career in the opposition in 2004 as Popular Movement of Kyrgyzstan Central Council Chairman. Promoting the interests of the people then, Bakiyev set out to nullify Akayev's administrative resource. Society's rage fomented by the rigged parliamentary election elevated Bakiyev to the pinnacle of political power a year later. Bloodless dethroning of the president everyone had been thoroughly fed up sparked the hope for changes in Kyrgyzstan and other Central Asian countries. Forget all those naive hopes. Fruits of the Tulip Revolution mutated into another authoritarian regime. Bakiyev was born in the southern regions of Kyrgyzstan in 1949. He got his college diploma and spent the next decade as a mere engineer before becoming a factory director in 1985. Bakiyev became governor of his native Jalalabad region in 1995. He was Chui governor between 1997 and 2000 when he finally became the prime minister. His premiership over in 2002, Bakiyev spent the next three years as a lawmaker in the then two-house parliament. Bakiyev joined the centrist Kyrgyz Regions faction in 2003 and became Popular Movement of Kyrgyzstan Central Council Chairman a year later. He was elected the president in July 2005 when he polled 88.65% votes. Prime minister and acting president in April 2005, Bakiyev never missed a chance to deride his predecessor. Referring to the classified materials discovered in Akayev's personal archives, he used to say that provocations against the opposition had been engineered and orchestrated by the ex-president himself. 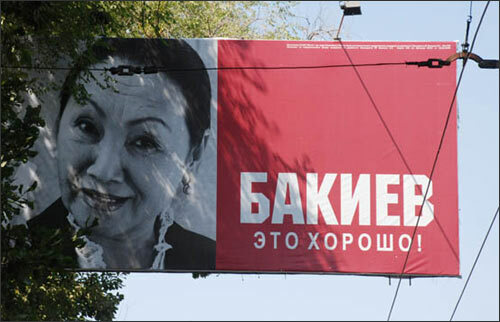 By mid-2009, Bakiyev crushed all democratic institutions he had once promoted and defended with ardor. The political situation in Kyrgyzstan repeats itself. Bakiyev's two principal opponents and their supporters call the recent election the dirtiest in the history of Kyrgyzstan and demand its annulment. Considering the nature of the opposition which is never exactly lily-white itself, one might question validity of its claims but... Practically all independent observers reported gross violations in the course of the election. The Civil Organizations Alliance called the election "a sham". ENEMO (European Network of Election Monitoring Organizations) confirmed systematic violations too. The OSCE mission condemned the election in Kyrgyzstan as inadequate from the standpoint of the OSCE standards and said that candidate Bakiyev had used the administrative resource and prejudiced coverage of the campaign in the media to his benefit. That Kyrgyzstan's colleagues from the Shanghai Cooperation Organization and Commonwealth backed Bakiyev goes without saying. Observers from these two structures failed to notice any violations, confirmed validity of bulletin count, and offered their wholehearted congratulations to Bakiyev. The widespread opinion in Kyrgyzstan (shared even by his opponents) is that Bakiyev would have easily won without going to all this trouble. He would have polled 50-60% and Atambayev, 20-30% - no more. It would have been civilized at least. For some reason, however, figures appear to have their own inexplicable attraction to those at the top. Niyazov, the august tyrant a.k.a. president for life a.k.a. the head of all Turkmens, liked impressive figures too. The Turkmenbashi died 2,5 years ago, but his cause must have outlived its creator. Authoritarian family rule, abuse of power to promote one's interests, and intolerance with regard to opponents are classic features of Asian politics. In post-revolutionary Kyrgyzstan too, it seems. It is clear now that the March 2005 Revolution has had no invigorating - morally or physiologically - effect on the Kyrgyz regime. The so called replacement of the elites never took place. The Kyrgyz state is still ruled by officials and party functionaries of the late Soviet era - the bigwigs emulating European political standards and not exactly convincingly at that. Bakiyev is but one of them.